the whole month of july was spent with family members who live abroad who flew in for their summer hols. and now they're all gone, they all flew back from whence they came huhuhu... we particularly miss our four nieces, aged 10, 8, 6, and 3. they were all born and raised in madrid. 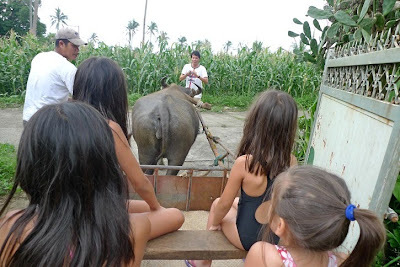 here they are at lolo and granny's farm in tagyatay, riding a carabao-drawn cart. walang ganyan sa spain! because they were sitting behind ruffa (that's the carabao's name), it kinda stank, so the little one in black kept holding her nose and finally said, "i can't live like this!" hahahaha!!! but years from now, she'll look back at this day and remember it fondly. so if you have babies, make each day a memorable one for them. how about getting them these eebees developmental toys? 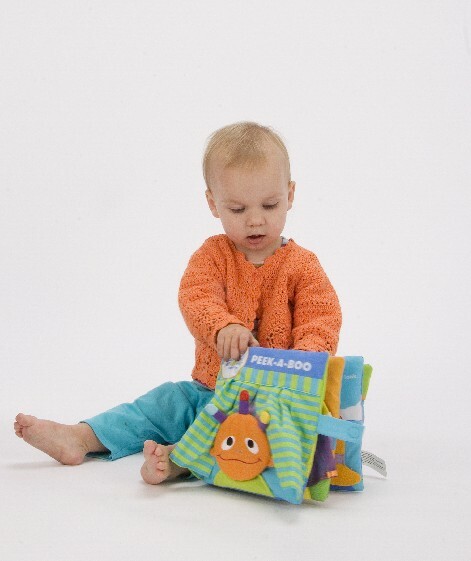 The Every Baby Company began with the award-winning and critically acclaimed eebee’s adventures, an innovative, character- based DVD series, form 6 to 36 months old. Eebee’s adventure is the first infant media property that is securely based on the latest learning research and the effective use of media. Eebee is the only character ever developed specifically for the infant/ toddler market. Eebee’s adventures has a strong and established foundation in the market: 3 DVDs, eebee doll, and VOD distribution in nearly 30 million households; prime real estate and sell out sales at FAO Schwarz and multi-product plans with Barnes and Noble. A brief background of the company the Every Baby Company was founded in the year 2004 with a simple yet essential mission to be a catalyst for rich play experiences that: reflect the latest developmental research, engage babies with new ideas through play about how the world works for babies and babies work in the world and lastly enhance and encourage meaningful communication, and interaction between children and parents, caregivers, and play partners of all ages. Now back to eebee- eebee has alot of milestones to show off such as publishing the first ever cooking with baby book, toys and awarded US specialty toy retail rollout 09-10,on TV its aired twice a day on American Forces Network worldwide, on video over 9 million episodes viewed since 2006 on Demand via Comcast, Cox, Cablevision, Charter, Bresnan, others, and is critically acclaimed for supernany “expert” contributor and many more! So what are you waiting for come, join and play with eebes’s adventures. eebees is available exclusively at rustan's in ayala center, shangri-la plaza, and alabang town center.